In honor of National Burrito Day today, Chipotle has put out some fun facts regarding their burrito sales in the US, including which state consumes the most burritos per person. 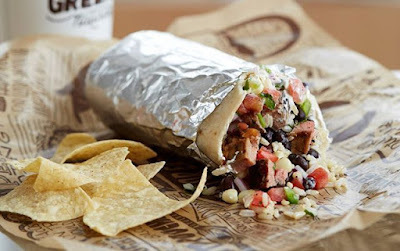 In so far as burrito consumption goes, it's folks in Wyoming that eats the most burritos per person at Chipotle (followed by Montana, Utah, Colorado, and Idaho). If you're wondering where their burritos don't do so hot, you can look over at Alabama (Georgia, Texas, and New York at down there as well). - Vegetarian sofritas does the best in Utah. - Guacamole goes over well in Maine. - Besides burritos, Wyoming is also tops for meat (barbacoa, carnitas, chicken, and steak) in general. - The states that consumes the most Chipotle dairy (sour cream and cheese) per person is Ohio. - Spicy red salsa is often added in New Mexico, Texas, and Arizona, while Maryland, Virginia, and Florida opt for the more mild pico de gallo. The preferences are based on data gathered from Chipotle's US sales from October 2016 to October 2017. Apparently if it wasn't adjusted per person, California (#21 in the burrito consumption ranking) would win in every category.